- Murph lowers his Championship record of 52.19 from the morning heats, to a scintillating 51.94 for the 100m Back gold with a dominant turn & back half. Just 0.09 sec off his World Record! - Thleen fought valiantly to secure a bronze medal in the tightly-contested women's race with her 58.83, 0.22 sec off former WR holder Kylie Masse (CAN)'s winning time. Not to make any excuses lol, but the abbreviated period between Nationals & Pan Pacs this year, along with Team USA's late arrival in Japan (jet-lag etc), appears to have possibly impacted quite a few of the American swimmers with regards to their slower swims here relative to Irvine...imo. - Seli led off Team USA with a 1:46.75 to help his country to a gold medal in the 4x200m Free relay. - Nathan's 48.32 is good enough for runner up in the B final of the 100m Free final, but unfortunately not fast enough to qualify for an individual spot in this event for Worlds next year. He'll get another opportunity in the 50m Free on the last day of the competition. After setting a personal best in the 200 free preliminaries on day 1 of the Pan Pacific Championships in 1:56.88, American Katie McLaughlin followed up with a 1:55.47 relay split on the American 800 free relay on day 2. 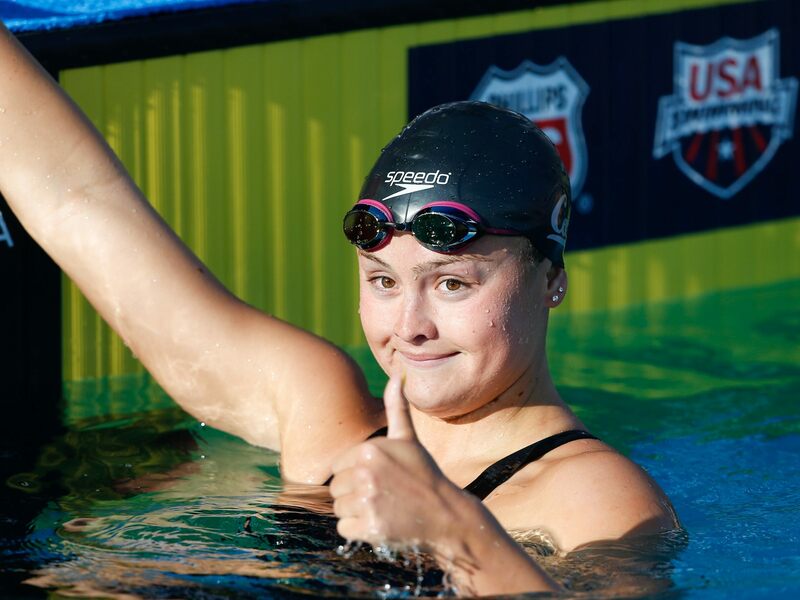 Prior to this year, the 21-year-old rising senior at Cal had her best season in 2015, when she placed 6th at the World Championships in the 200 fly and split 1:56.92 on the victorious American 800 free relay. Earlier that season, McLaughlin swam a lifetime best of 1:57.55 in the 200 free. She approached that last month at U.S. Nationals, winning the consolation final in 1:58.20, and then finally erased her PB on Wednesday with her 1:56.88 in the heats. 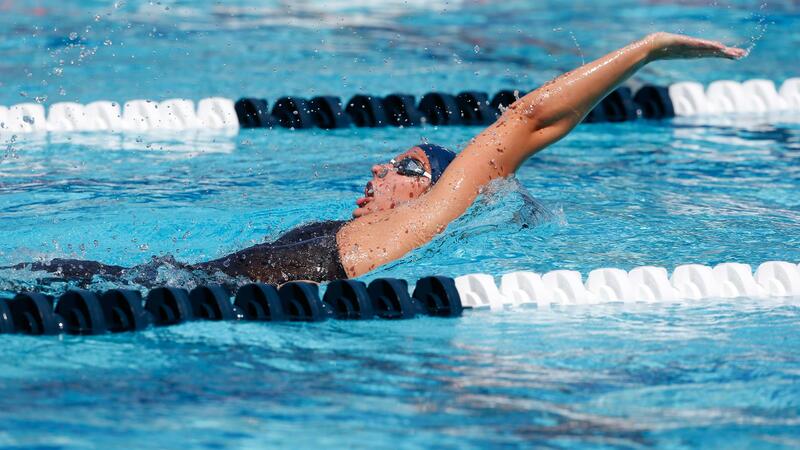 That swim got her into the B-final, where she won in 1:57.34, and cemented her spot on the 800 free relay. Nearly a full second and a half under her flat start best, McLaughlin's 1:55.47 split stood up as the 4th-fastest flying leg in the field (Ariarne Titmus led off in 1:55.27) behind only individual medalists Taylor Ruck (1:54.08), Rikako Ikee (1:54.69) and Katie Ledecky (1:53.84). Despite the quick splits from McLaughlin and Ledecky, Allison Schmitt's 1:58.62 lead-off put them in a hole they couldn't quite dig themselves out of, as the Aussies broke the Commonwealth Record and won gold in 7:44.12 with the Americans back in 7:44.37 for silver. McLaughlin also recorded a personal best in the 100 freestyle during day 2 prelims, clocking 54.14 to narrowly miss a spot in the 'B' heat as the 5th fastest American. 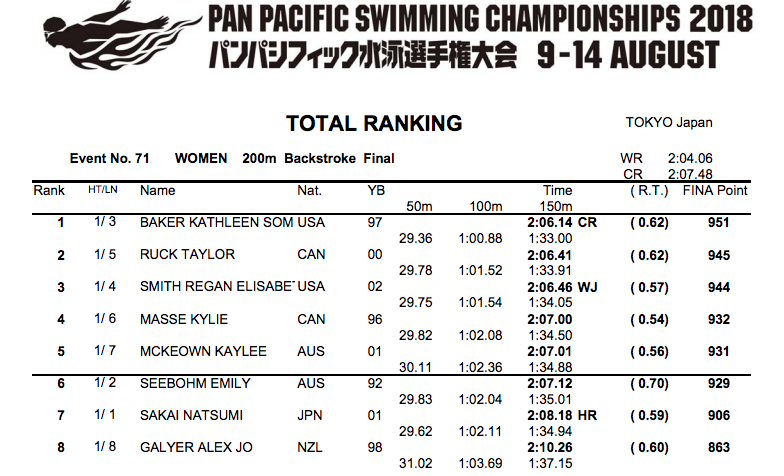 Based on what we've seen so far in Tokyo, McLaughlin will lock up her spot on the World Championship team in the 100 fly, and will be a very valuable asset next summer on the relay after that 1:55.47 split. Grieshop 5th American, so out of 4free finals altogether. Katie McL into B finals with the 6th overall time, but Dahlia and Comerford placed 2nd and 5th. Really hope that Regan Smith will choose Cal. At nationals, she used underwater to keep up with Baker in 200 back (Baker then improved her turn in 100 back, just 2 days later). Yesterday, Smith used underwater to stay with McLaughlin in 100 fly. Teri McKeever certainly can coach Smith to get even better and continue the back & fly tradition at Cal. It was odd that U.S. coaches didn't use Baker in 4x200 relay even though she is a great 200 freestyler among her many other talents. Katie McL, you're going to Worlds!! Butterflyers Jack Conger and Katie McLaughlin locked in trips to the 2019 World Championships as a part of Team USA, the result of day 3 of the Pan Pacific Championships. Neither bettered their times from U.S. Nationals, but neither had to. Conger took silver behind Caeleb Dressel, and McLaughlin won the B final while second American Mallory Comerford failed to beat her time from Nationals. The American quartet of Caeleb Dressel, Blake Pieroni, Zach Apple and Nathan Adrian had combined to win gold in the men's 400 free relay in a new meet record of 3:11.67 at the Pan Pacific Championships in Tokyo, but shortly after the relay they were disqualified for swimming out of order. Sources tell SwimSwam that the swimmers were told the wrong order by the coaches. Adrian had narrowly held off the Brazilian with a 47.27 anchor leg of his own. Guess this incident calls for Dave to lead the men next summer in Korea. -Abbey 6th into 50 free A finals! We really don't need Taylor Ruck to step foot onto LSJU next fall. Yesterday, Smith used underwater to stay with McLaughlin in 100 fly. Teri McKeever certainly can coach Smith to get even better and continue the back & fly tradition at Cal. - Murph bested his PB from Rio for a convincing victory in the 200m Back, lowering his meet record from prelims by half a sec. - Pebs won the B final, and is confirmed for the 2019 Worlds team thanks to his 200m Back time from Nationals. - Ryan went on to lead off Team USA (Nathan anchoring) to the gold in the 4x100m Medley relay by a (very) slim margin over Japan & Australia. - Jarod contributed to Team Philippines on their fly leg. - Prenot ended up 5th in the 200m Breast A final. His 2:07.28 from Nationals has Josh into Worlds as the fastest American (by far). - Abbey improved upon her 50m Free time from Nationals, claiming 5th in the A final and thus securing her individual event spot for Worlds (think that Weitzeil had already qualified via the 4x100m Free relay?). - Thleen out-classed incoming superstar sapling Taylor Ruck (who in turn just out-touched 2020 phenom recruit Regan Smith) to, appropriately enough, break Lizzie's Pan Pac Championship record from 2010 by over a second - well done! 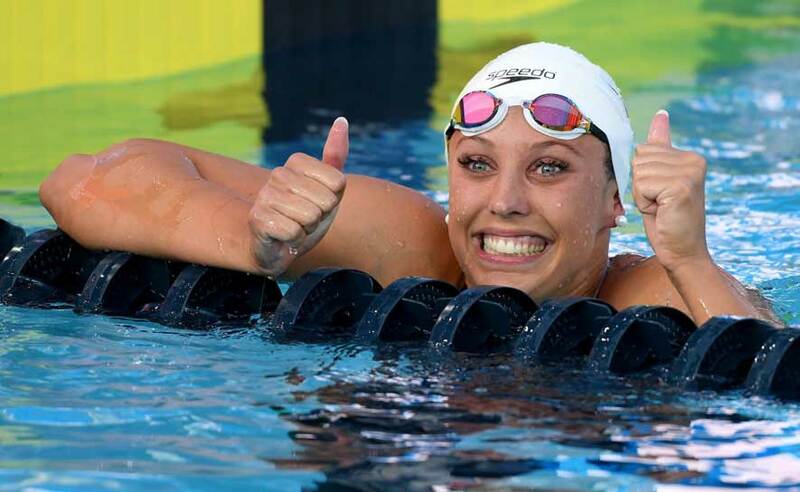 Only Americans to have ever swum faster are Missy, DiRado & Hoelzer. Thleen Bean closed out her Pan Pacs by leading off USA's 4x100m Medley relay in their valiant effort which culminated in a silver medal, faster than Russia's winning time @ 2018 Euros. No bets on Izzy into WUGs, especially since she'll only be swimming as part of the 800 Free Relay; as per this comment on SwimSwam, she could be bumped down to Pan Ams, or even entirely off a team for next summer: "I think there's so much variability with WUGs that it's almost too difficult to predict the roster. There are so many swimmers that are unknowns (whether or not they're enrolled in school): Meitz, Bratton, Caneta, Galat, Gabby Deloof, Meaghan Raab, and Emily Escobedo to name a few. The 200 free could be turned on it's head if these "age" eligible swimmers are still enrolled in college and working towards their degree. And, of course, if the roster for WUGs changes, then so does the roster for Pan Ams. I have the feeling lots of news is yet to come"
Thanks to everyone for those amazing posts & pictures! At a meet where the Americans won more than half of the available gold medals, Team USA's collegiate footprint was front and center. Fifty-five percent of Team USA athletes medaled, with standout performances by Katie Ledecky (Stanford), Simone Manuel (Stanford) and Caeleb Dressel (Florida), who each earned five medals. Meanwhile, Leah Smith (Virginia) and Kathleen Baker (Cal) tallied four medals apiece in the pool. USA Swimming's Pan Pacs roster represented 20 universities: Cal (9 athletes), Stanford (6), Georgia (6), Auburn (3), Indiana (3), Louisville (3), Texas (3), Arizona (2), Florida (2), NC State (2), Northwestern (2), Southern California (2), Columbia, Duke, Emory, Michigan, Penn State, Tennessee, Texas A&M and Virginia. Pac 12 rivals Stanford and Cal tied with 11 medals each. 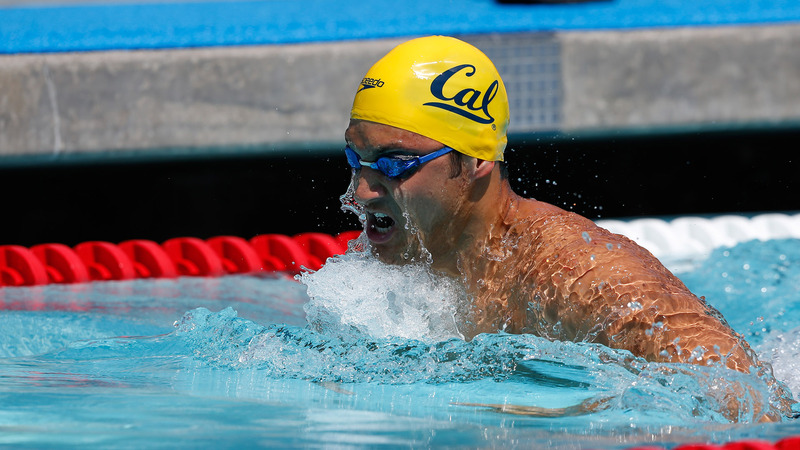 En route to three gold medals, Ryan Murphy (Cal) set a Pan Pac record in the 100-meter backstroke, nearly set a world record in the 200 backstroke and led the way for Team USA in the 400 medley relay. 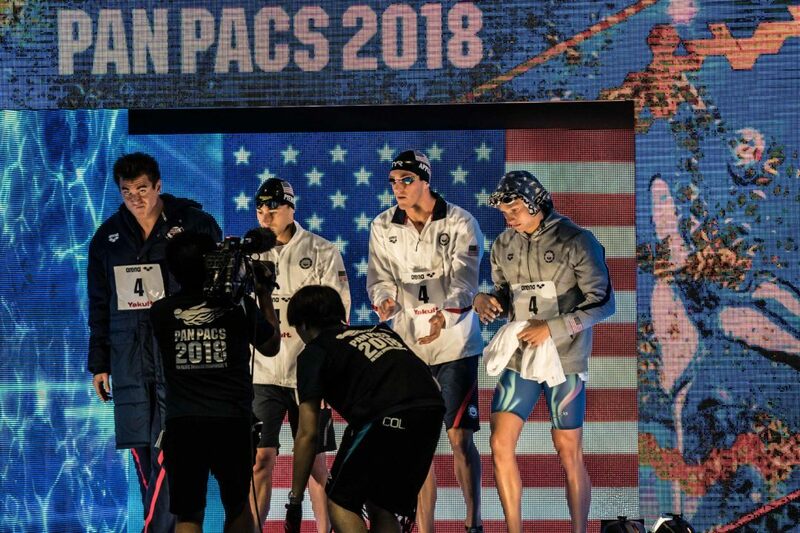 Pan Pacs, the biggest meet of the year for U.S. swimmers, was a display of American talent in the water, helped determine the roster for the 2019 world championships and gave Team USA athletes a glimpse of the city they hope to return to in less than two years for the Olympic Games Tokyo 2020. Cal legacy/LSJU law school drop out Bill Walton on the Golden State/Conference of Champions: If the Pilgrims had landed on the West Coast, the East Coast would still be wilderness. As we understand, the men's 400 free relay was nominated, but were on the ballot in the wrong order sonevermind. The only 2 American relay golds at Pan Pacs - the 800 free relay had the Haas 1:43.78 anchor, while the medley relay had a thrilling finish with Nathan Adrian running down Katsumi Nakamura (and Kyle Chalmers almost running them both down). Both times need to get way faster to contend in Gwangju, but Haas' relay anchor takes the cake for us. If Andrew beats a full-strength Dressel in the 50, or clips Dressel's 21.15 from Worlds last year, he's the choice. As it stands, though, Murphy's 51.94 in the 100 back, .09 from a World Record, was as close as the American men came to a World Record this season, so we'll give him the nod. t's so hard to judge Chase Kalisz's swims when he's so far ahead of the rest of the US (and, really, the world) right now. 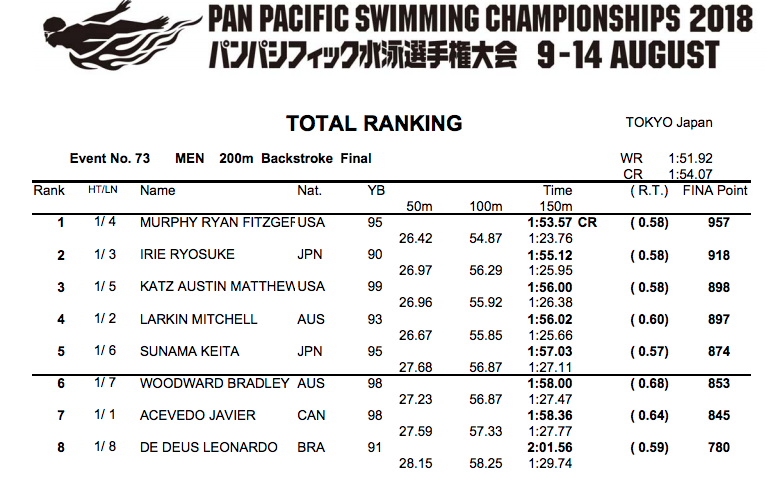 Both he and Murphy took 2 individual wins at Pan Pacs. Murphy picked up a medley medal as well, and broke 2 Championship Records to boot (though, Kalisz is chasing Phelps' records). Kalisz had two #1 World Rankings Murphy had only 1, and Wilimosvky none. But Wilimovsky won the 1500 and took silver in the 800 in the pool, AND won the open water 10k the latter of which doesn't carry meaningful World Rankings. We'll give the edge to Murphy, because of the World #1 rankings, and the fact that his 100 back was just .09 from the World Record. But know that we were really tempted by the Wilimovsky pool-open water double. JACKSONVILLE, Fla. Fifteen annual awards honoring the best of American swimming in 2018 were presented at the USA Swimming House of Delegates meeting on Friday at the United States Aquatic Sports Convention. 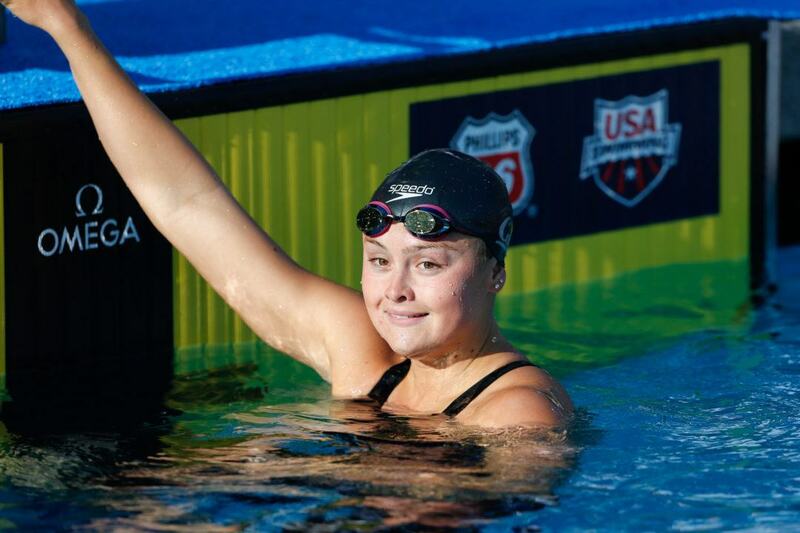 Among the highlighted honors was the Phillips 66 Performance of the Year Award presented to Kathleen Baker (Winston-Salem, N.C./Team Elite/California Aquatics) for her world-record performance of 58.00 seconds in the 100-meter backstroke at the 2018 Phillips 66 National Championships. Following a breakout 2015 season, Katie McLaughlin seemed well positioned to make a run at the 2016 Olympic Team before fracturing two vertebrae in her lower neck in January 2016. She's been on the comeback trail ever since, and McLaughlin completed her return to major international competition with a runner-up finish in the 100m butterfly at Phillips 66 Nationals in a lifetime-best swim of 57.51. In Tokyo, McLaughlin earned a silver medal as a member of the 4x200m freestyle relay. Gabby Deloof was already qualified for the Worlds team, but remains eligible for WUGs despite finishing her NCAA career last spring. She jumps into both the 100 and 200 frees, bumping former relay-only swimmers Isabel Ivey, Geena Freriks and Lucie Nordmann. 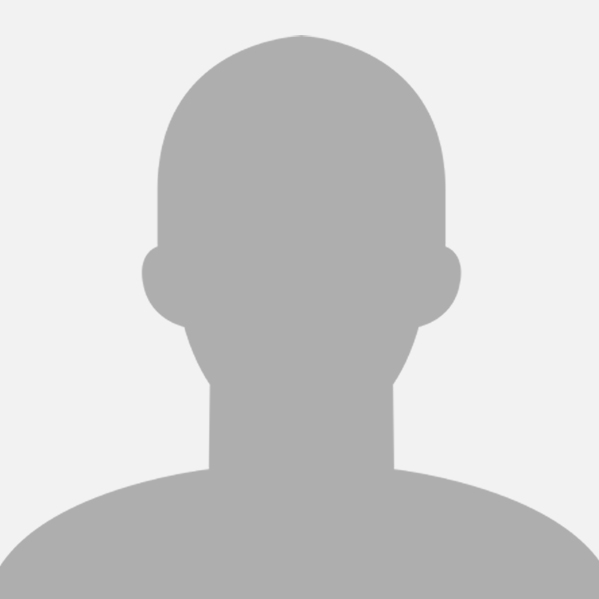 Any chance Izzy may make Pan Ams later that summer? Congrats to Dave Durden. A well deserving honor!